Fishing was good this past week... this is a great time of year for big native steelhead. The rivers dropped after the last heavy rains and there seemed to be a good number of fish around. As usual we have had to work hard and be patient. Large dark leeches and intruders were ambushed by both brilliantly colored bucks and chrome bright hens. We have had a few light grabs, but mostly angry "hit on the run" takes! The north Oregon coastal rivers are at their peak beauty right now, with all kinds of blooming plants and flowers, including skunk cabbage and trilliums. Newts are crawling the banks, so watch your step! Water ouzels are splashing around, bald eagles are migrating, and the banks are littered with elk tracks. All this wild activity provides insight to what might be happening underneath the rivers' current. This is an active time for wild steelhead too. The first few days of fishing in high water I noticed quite a bit of spawning activity. I am always fascinated by a pod of spawning steelhead... generally one hen laying eggs, and one large buck hanging out with her. Usually there are a group of smaller steelhead and big cutthroat harassing the big buck, keeping him very busy chasing them away. Of course we just watch, and never cast to these fish. as the rivers dropped, I noticed many of these areas became shallow and the spawning fish disappeared. Point is, just because you don't see fish spawning doesn't mean there aren't eggs laying in the cobblestone and gravel. Be selective where you wade and fish. 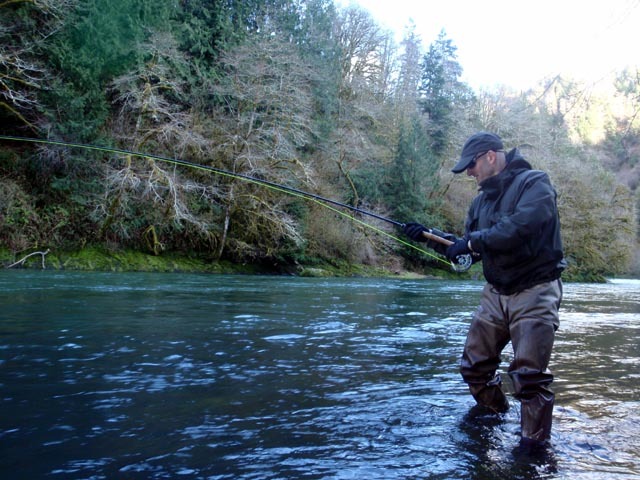 Winter steelhead spawn in waves, beginning in February (maybe earlier?) and lasting through May. The coastal rivers are prone to flooding, and this is nature's way of making sure some of the spawns are successful. While many steelhead spawn in April, many chrome bright fish are just making their appearance. We have at least a few more weeks of great fishing opportunities.